California Board Company Surfboards Review: Read Before Buying! The California lifestyle is represented by sunny, 75-degree weather year-round, long days at white sand beaches, and (of course) clean, perfectly blue waves. While this sounds like a fantasy, Californians know it’s really not too far off. For those fortunate enough to live the California lifestyle, there’s something obviously missing from this recipe… a surfboard. Californians don’t sit on the beach reading books or sipping Piña Coladas – they siton the beach in between surf sessions. Don’t find yourself left out of this awesome part of California culture. California Board Company sells all types of boards tailored to fulfill all of your boarding needs. They sell skim boards, stand up paddleboards, wakeboards, bodyboards, and of course – surfboards. We’re reviewing our favorite CBC surfboards so that you don’t need to look any further to find the board that’s perfect for you. The EPS foam core will ensure that these boards are durable enough to surf waves of all shapes and sizes without getting dinged, and they can sit in the sun next to you without ever delaminating (like a typical surfboard would). CBC says, “If it’s made by us… it’s a Keeper!”, and we agree! See for yourself how CBC boards are long-lasting and suited for all types of riders. They want to encourage the joy that this California lifestyle brings, no matter where you live and how you get in the water. 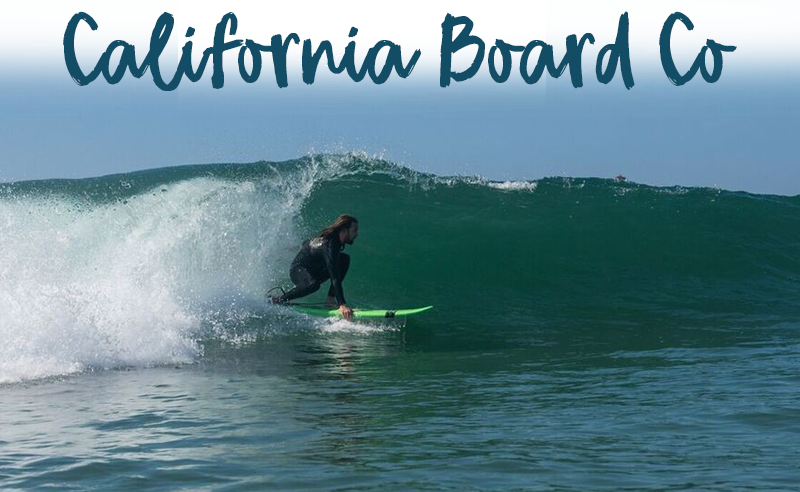 ​We love California Board Company because they have a variety of boards so that any surfer can enjoy their boards. Nothing is worse than showing up to the beach, looking out at the waves, and realizing that your board won’t work in the conditions up for offer. This tragedy won’t happen with CBC boards because they’re versatile enough for any surfer and any wave. The CBC 7’ Soft Top is as buoyant as a 7’ can be, which is ideal for beginners and larger surfers. At 22’ wide and 3 1/2’ thick, it won’t be difficult to get into smaller waves on this 7’; but, it’ll still work well in larger conditions The versatility of this board is a perfect example of why CBC surfboards are great in all types of waves. With a triple wooden stringer and woodgrain graphic, this board looks as sturdy as it really is. You’ll reap the benefits of a curable foam surfboard without sacrificing the old-school look of a board shaped from real wood. CBC takes advantage of modern surfboard technology without sacrificing the cool look of an old log. The CBC 6’2” Fish Soft Top is prime for surfers up to 175 pounds. It’s specially made for smaller riders, or those that are more advanced. This board works best in bigger waves because the fish tail will allow for speed and long, drawn out turns. It won’t easily snap in larger surf because of it’s triple, multi-layered stringers coated with waterproof resin. This board can be ridden as a twin fin or a thruster, but it includes three fins, a traction pad, and a leash. You’ll never get to the beach and realize you forgot your wax because you won’t need any with this molded foam deck and large traction pad. The CBC 5’8” Soft Top is the smallest of CBC’s boards, making it best for the younger rider. 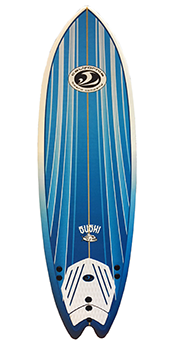 With a narrow width of two inches, this board is lightweight and quick, but not suited for the larger surfer. Your grom won’t get hurt clunking their head on this seven-pound soft top, but they’ll still have enough volue to paddle themselves into all types of waves. With a blue and green graphic design and an attached traction pad, this board looks as good as it surfs. It includes a leash and three blue-colored fins to match the color of the board. Ideal for surfers of all sizes, the CBC 9’ Soft Top is the larger board CBC has to offer. With a hefty 24” x 4” core, this board will paddle easily and make getting into waves a breeze. This large size is perfect for beginners who will benefit from the stability, or more advanced surfers with a rocky home break. The wooden graphic makes this board look like a typical longboard, but it definitely won’t ding like one. It’s 100% waterproof EPS core will ensure that it sticks with you for years. The 9’ is a great choice for any surfer. California Board Company was founded in 2008 by surfers whose motto is “Building the best stand up paddleboards, surfboards and bodyboards putting thousands of enthusiasts in the water at affordable prices”. Two California surfers, Scott and Mark, formulated the idea for this company over dinner. Mark had the retail experience and Scott had been shaping boards since 1981. They teamed up with two other surfers, Charlie and Michael, and CBC was born. Sporting goods stores like Dicks Sporting Goods, Isup World, and many more sell their products with pride. They have killer reviews from their team riders, who can be seen surfing CBC boards up and down California’s coast. CBC makes bodyboards, surfboards, stand up paddle boards, skim boards, and even kickboards! If the waves are bad, or surfing just isn’t your thing, try out another boarding activity and see for yourself how versatile CBC’s products really are. While each of these boards are tailored to a different sized surfer, they’re all versatile and buoyant enough to float almost anyone. It’s definitely smart to keep your height and weight in mind, and purchase the board most suited to your size. What Other Products Does CBC Manufacture? CBC sells everything a surfer could need, from bodyboards to stand up paddleboards. They also sell leashes specially made for each board, so that you won’t get wrapped up in a leash that’s too long. 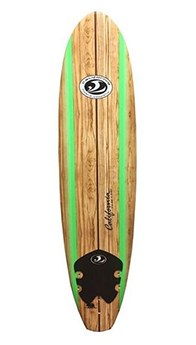 Each board comes with three fins and a leash specially sized for the dimensions of the surfboard. CBC even attaches a traction pad to each board to ensure that they’re your one-stop shop for surfboards. Why Choose a Foam Board? Made from EPS foam, soft tops are great boards for beginners. They’re also much more environmentally friendly than the average foam surfboard. Basically, there are three types of foam blanks that are commonly used as the inner core of a surfboard: Polyurethane, Polystyrene, and Expanded Polystyrene. - Expanded Polystyrene has gained popularity as it is the lightest, the least likely to deteriorate over time, and it is recyclable. Expanded Polystyrene, aka EPS foam, does not trade environmental friendliness for durability, making it the most ideal inner core material. All of CBC’s boards use EPS foam. In addition to CBC, there are several other good board companies in the market right now, we go over a full review of the top foam boards in our Center For Surf Research page here. We think that California Board Company makes durable, versatile, and overall A+ quality surfboards. These boards can be purchased online on Amazon, or on lots of other great sporting goods sites. They sell tons of boards for all of your water sport’s needs, so that you can still have fun when the waves aren’t consistent.